Disappearance is a series of wet plate collodion tintype photograms by the artist, S. Gayle Stevens. 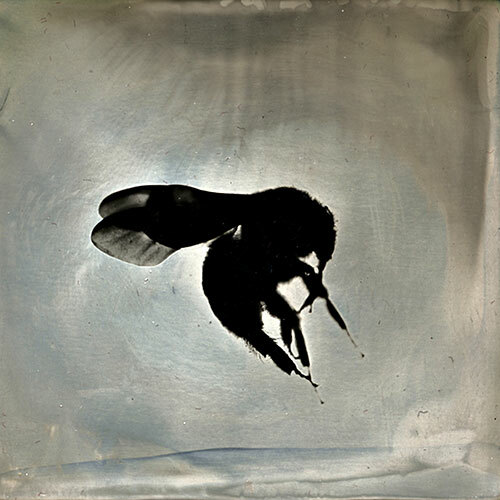 Anyone can participate in the exhibition disappearance by purchasing a 2”x 2” tintype of an individual bee, watching the bees vanish from the installation. The photogram silhouettes are shadows of bees that once lived, and the large plates show the enormity of the issue, Colony Collapse Disorder. The purpose is to create greater awareness of the problem. Whenever possible, Gayle works with local apiarists, having them speak on CCD issues and the importance of our pollinators. Ten percent of the sales are donated to local apiarists. Ms. Stevens has worked in antiquarian photographic processes for over 15 years. She received her MFA from the School of the Art Institute of Chicago in 1999 and is an educator, juror, curator and active member of the photographic community.